Hard thing: It was so hard to extract IKAKKU'S HEAD! Its so round, I CANT SEE IT RIGHT! Well this looks great. Very cool looking background. Well Nicely Done! I can't believe it...dis is soooo cool! oh it seem like you're angry Rikka-chan lol XP, thnx for dedicate to me sweetie ^___^, yay you're so worrying for me thnx you much much *huggies*. i love those digital plus somehow hard thing style from your wall ^__^, cool effect from the BG too :D. you're great rikka-chan ^__^. Oh My God...the character and the background is perfectly match... Plus the color of the background is totally show out the environment for this wallpaper... Great works! I think u may have found a style of your own, very nice, Ikkaku's head turned out rather well, try vectoring the head next time, the rest is all right, great work on the background. I like the bg, the colors are crazy! Nice job! It looks great, plus it features some of the best fighters from Bleach (including Ishida <3). Nice work. 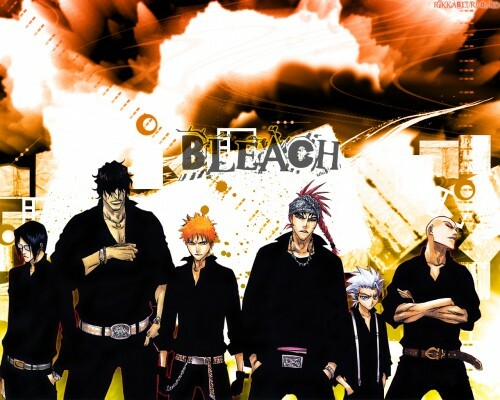 wah.. bleach with an attitude.. the effect is shown thru all the colours and the pose of the characters.. nice..
Nice...what a bunch of thuggin badass dudes you got there. Looks great I love the background too. 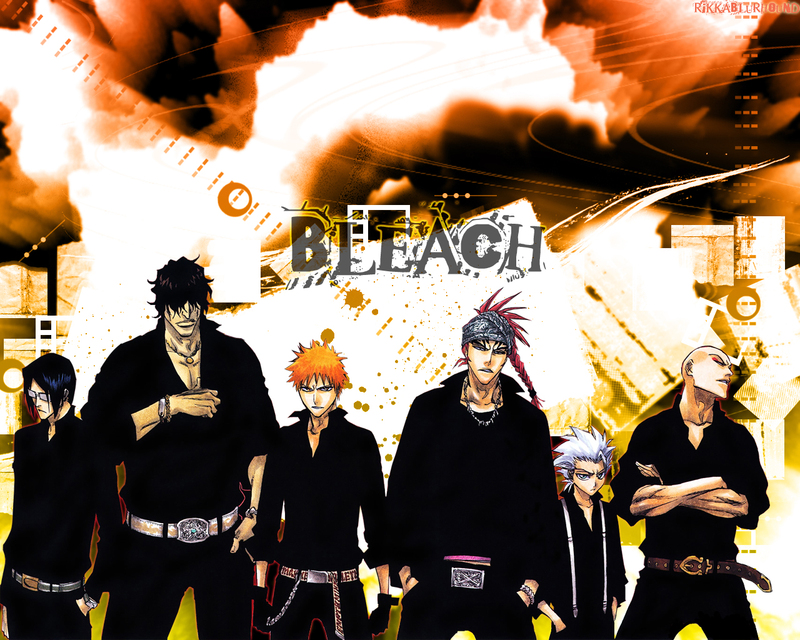 Also is the Bleach logo you used from one of the op's of the show...it looks as if it was, so great job I like it. oh crap...I was doing the same scan too...now I have to think of something else =.="
Very cool! I like the scan you used and the bg. Good work! - You may want to center the scans a little more; giving equal space on either side. - The BG is cool and pretty well done but it just doesn't match the scan IMO. Find a way to get around that. - Add a little grunge texture and this will be better. Overall, it's still a worthy desktop wallpaper. That's what it matters.